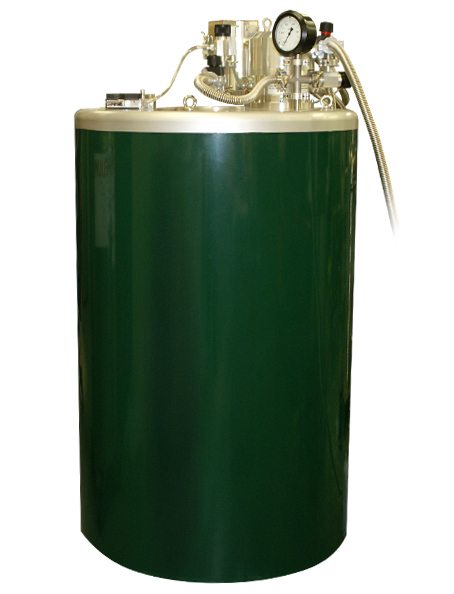 A re-condensing cryostat is available for certain types of liquid cooled systems. With this option a two stage cryocooler is used to intercept heat loads to the radiation shield and helium reservoir. The first stage of the cryocooler is connected to a radiation shield which will cool to approximately 50K whilst the second stage is linked directly to the gas charge above the helium reservoir via an optimised heat exchanger. In normal operation the cryostat is filled initially with liquid helium. Thereafter the level in the liquid helium reservoir is maintained by the cryocooler condensing the helium gas at the heat exchanger. If the cryocooler is turned off or there is a power cut then the liquid helium level in the reservoir will fall. However, once the cryocooler is re-started the level in the reservoir may be replenished by connected a helium gas charge to the head of the cryostat. The re-condensing cryostat may also be used in conjunction with certain types of variable temperature inserts (VTI). In this configuration a dry scroll pump is used to draw helium from the main reservoir into the VTI. The helium gas exiting at the head of the VTI is circulated back into the cryostat via a series of heat exchangers and is finally liquefied into the main reservoir. The re-condensing cryostat option reduces system operating costs substantially and is particularly relevant where helium is expensive and regular supplies are difficulty to acquire.